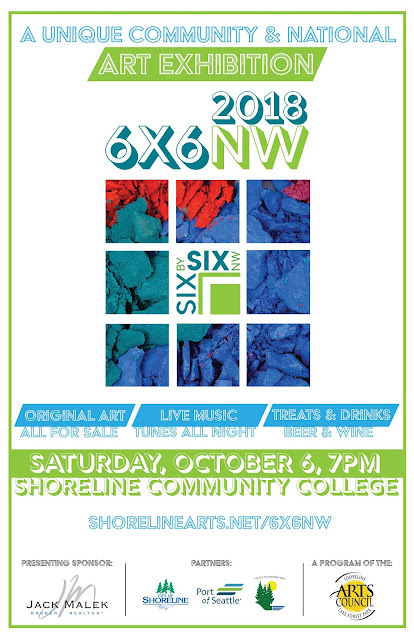 6X6NW is back once again! For one night, 850+ 6 x 6-inch artworks from more than 180 artists across the country will be exhibited at the Shoreline Community College. This evening event includes treats, drinks, live music, and the chance to purchase any of the artworks for $36. If you see something you like, you better act fast, because eager art collectors will be welcome to pull their purchases right off the walls! Concerned you might not get the piece you pine for? Purchase a ticket for the Collector’s Choice raffle for a chance to select any masterpiece you would like before the buying frenzy begins. Doors open at 7pm for refreshments and time to view the works on display while mingling with friends and artists. Art purchasing begins at 8pm! Thanks also to the City of Shoreline, Port of Seattle, City of Lake Forest Park, and 4Culture King County for your support.